Looking inside the fruit: longitudinal cut. The edible fruit is much appreciated within the plants native range. 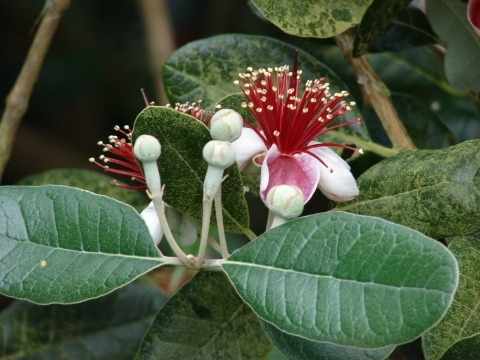 The plant is sometimes cultivated in warm temperate to tropical regions, both for its edible fruit and also as an ornamental plant, where it is valued especially for its very attractive flowers. S. America - Argentina, Uruguay, southern and eastern Brazil. ]. Tropical and sub-tropical highlands below 1,000 metres. The on-line catalogue of a company selling seeds. Gives descriptions, photos and uses of a very wide range of fruit and other food-producing plants plus ornamentals. ]. It is a rich source of iodine. ]. Prick out the seedlings into individual pots as soon as they are large enough to handle. Grow on until large enough to plant out in permanent positions.